A seminal science fiction film, Planet Of The Apes challenges humanity's status as the dominant species through a provocative confrontation on a planet ruled by apes. On-board a spaceship, astronaut Taylor (Charlton Heston) and three crew members enter deep hibernation as they head back to Earth after an 18 month journey. Due to their near light speeds of travel and time dilation, Taylor knows that close to 2000 years would have elapsed on Earth by the time of their return. The crew is awoken when the spacecraft crash lands into a lake on a seemingly hostile, barren planet. Taylor, Landon (Robert Gunner) and Dodge (Jeff Burton) survive the crash and set about exploring their surroundings. They traverse a desert and reach fertile soil, where they first encounter foraging wild humans with no language skills, then civilized ape soldiers on horseback. Taylor is captured by the apes, treated like a wild animal, and taken to a nearby city. Held captive and treated like a savage, Taylor realizes that on this planet, the apes are the masters and the humans are the animals. He is introduced to ape scientists Cornelius (Roddy McDowall) and Zira (Kim Hunter), who are amazed to learn that Taylor can write and talk. 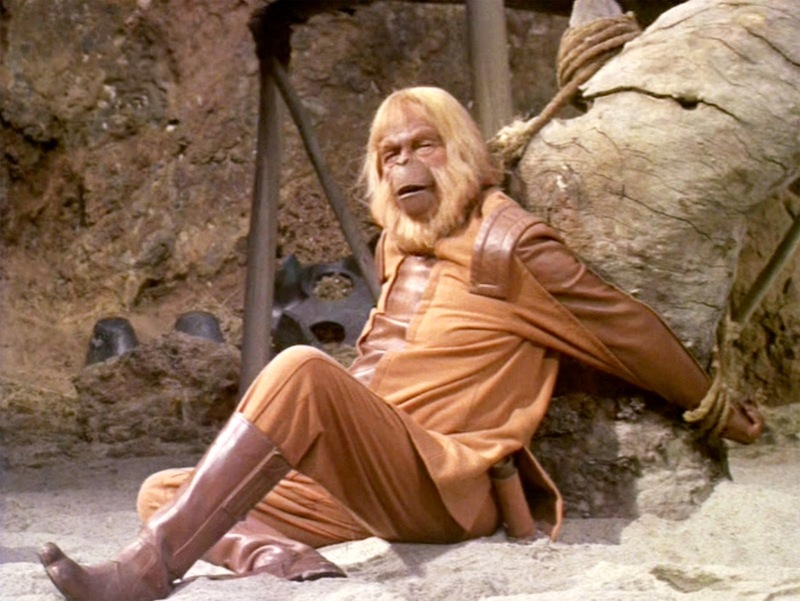 His mere presence casts doubt on the prevailing theories of ape supremacy, and he is immediately perceived as a threat by the ape leaders, including Dr. Zaius (Maurice Evans). Despite having the cage company of Nova (Linda Harrison), a wild woman, Taylor realizes that he is going to have to plot an escape to try and save himself from a fate worse than death. An adaptation of the book by Pierre Boulle, and with a screenplay co-written by Michael Wilson and Rod Serling, Planet Of The Apes is a stirring science fiction adventure in a land where evolution appears to have taken a different turn, and man gets to face a taste of his own medicine. The film enjoys debating religious, evolutionary, and species-specific arguments from the perspective of apes as rulers and humans as savages incapable of evolving. Presenting apes as intellectuals while the humans are confined to filthy cages is a brilliantly disconcerting premise. Director Franklin J. Schaffner constructs a three act movie with excellent pacing and plenty of bravado. The first third is survival against the elements: Taylor and his crew members have to traverse harsh terrain in a desperate search for sources of food and water. The middle third is the jarring introduction to the rudimentary ape society, where science, religion and philosophy are combined by the elders to weave enough of a foundation for the ape civilization to take hold. The arrival of Taylor is a disruptive, and unwelcome, surprise. The final third is a clash of the species. Taylor grows bolder, challenges the apes, and finds in Cornelius and Zira potential allies to help him survive and challenge the laws of the elders about the ranking of apes and humans on the evolutionary ladder. The movie is a constant source of intellectual stimulation. Schaffner maintains plenty of interest by emphasizing different exploratory levels, transition from the physical planet to the ape society and then the scientific implications to evolution and the origins of the planet. 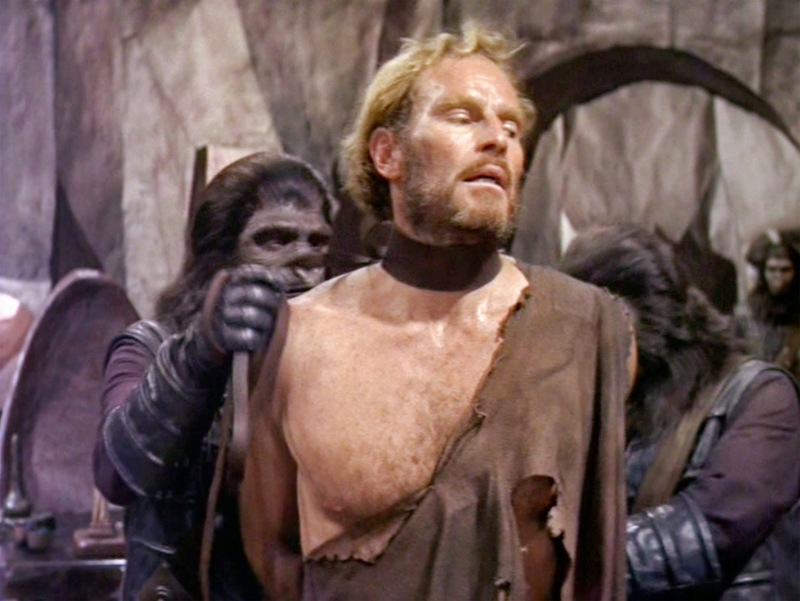 The revolutionary prosthetic makeup techniques by artist John Chambers are excellent, allowing McDowall, Hunter and Evans to express a range of emotions despite their facial appearances being fully transformed into apes. Charlton Heston gets to let loose as the last defender of humanity's honour, expressing rage and fury (with a substantial dose of 1960s anti-authoritarianism) but gradually realizing that his intellect will likely be his best weapon in the fight for survival. Planet Of The Apes is celebrated for a shock ending, Taylor forced to confront exactly where humanity stands when it comes to species supremacy. It's an unforgettable conclusion to an imaginative adventure exploring the farthest reaches of space and the most fundamental attributes of what it means to be human.